Go to Barry's blog and see what that's all about. Good luck Barry, and to all those undergoing cancer treatment. Cancer is an insidious disease and we've got to find a cure. For a close family member and even closer friend that cure couldn't come soon enough. She slipped from us earlier this week. So here's my bell, a last bell if you would, for her...and for her partner and best friend. I'm trying my best to believe this. I know she would have. What a wonderful poem! Those who live on in our hearts are with us forever. Best wishes to your friend too. Glad to see that his round of chemo is about over for him. Hope you continue to do well also. A beautiful sentiment. A wonderful gesture. What a lovely poem. 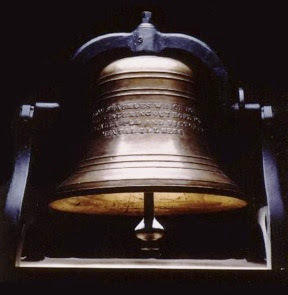 The day you ring the bell will be absolutely glorious! As much as I laugh in cancer's face, I can never forget that she does indeed win the battle SOMETIMES. But not you, me or Barry, k? At least not for a long, long time! You are such a thoughtful, insightful and humorous blogger. Thank-you for sharing YOU with us. Sorry, but it hits me hard as I'm sure YOU understand. I will gladly listen to the ringing of the bells! ...I don't know what else to say. I'm...verklempft. Really. Poignant post. Very sorry to hear of the loss of your friend this week and wish you the best with what is ahead for you. I hear that bell ringing. I checked out Barry's blog and wish all of us touched by cancer a future without the necessity to ring that particular bell, but knowledge that if/when we do, there are others to support us. All the best to your friend, and to you. Cancer is a monster. Take care. Hello - is there anybody out there? Thanks to everyone for their comments on this post. It's a bit of a bittersweet and tough weekend in our family as we say goodbye to a dear and close family friend. I appreciate everyone's heartfelt concerns. Cheers. Since I only visit for Theme Thursday, I had no idea that you had cancer I'm very sorry to hear it and wish you a complete recovery. So so sorry to hear of your friend I have a friend also, as do so many, who is losing her fight and will slip from us soon Very sad but thoughtful post. Best of luck to you and of course Barry. "Life means all that it ever meant." Let's see. Someone dead is speaking to someone still alive. So: death means all that life ever meant. Perhaps we have a problem. That's a beautiful poem, No Name. Thank you for sharing it with us.